Our spirituality needs revival, but the disciplines of the Spirit often go covered with dust, lying unused by Christians because they feel too much like rules. But what if they weren't rules? What if they were conversation starters? Invitations to discover God right now, today? 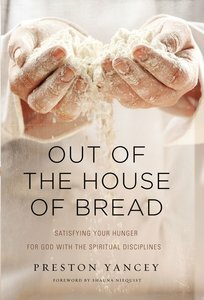 In Out of the House of Bread author Preston Yancey leads us in a new but old direction of spirituality engaging the symbolism and experience of spiritual disciplines made plain and accessible by the baking of bread. The benefits of this book of devotion include: finding a nearness to the holiness of Go and feeling and experiencing the forgiveness of God. You'll learn again the disciplines of celebration, confession, and conversion, encountering new avenues of prayer along the way. Each chapter pairs a spiritual discipline or practice with insight to the baking of an extraordinary loaf of bread. Readers encounter ancient practices such as the prayer of examen, lectio divina, intercessory prayer, icons, and wonder. Yancey shows how, like in Brother Lawrence's kitchen in The Practice of the Presence of God, that when you lift up your hands to God and pray, God will show up right there in the midst of your work and livelihood while you bake. Out of the House of Bread is a glorious celebration of the sacraments and the seasons of God, meant as reminders and forms of prayer to take readers closer to God in worship. An appendix about gluten-free and vegan bread and suggested reading and artwork for contemplation complete the book. About "Out of the House of Bread"
Preston Yancey is a lifelong Texan raised Southern Baptist who learned to read saints, cross himself, and move across the world. He thinks of himself as a patchwork Christian, who is most at home within the Anglican tradition. He is a writer, painter, baker, and academic. He subsists on a diet of caffeine and God's grace. He spent some time living in St. Andrews, Scotland but currently resides in Texas and is soon to be married.